Resellers that don’t want to miss out on the growing interest in SD-WAN should check out TELoIP. This company provides all the pieces of SD-WAN and packages it up for managed service providers and resellers to offer to their own customers. This month, TELoIP announced the availability of its Virtual Intelligent Network Overlay (VINO) WAN offering for branch and remote office connectivity. VINO WAN includes all the table-stakes features of an SD-WAN offering. It lets customers mix and match multiple circuits, including broadband and 3G/4G. These circuits tie into TELoIP’s overlay network for access to the Internet, cloud services, and headquarters connectivity. Virtualized functions, including encryption, firewalling, and bi-directional QoS, are available. TELoIP provides a portal to let providers and resellers provision, monitor, and manage the network for their customers. TELoIP has built out its own virtual network that links up 9 different Points of Presence (POPs) in carrier-neutral facilities in the United States and Canada. “We have our own AS, our own IP space that we advertise across our POPs, we manage our own upstream peering,” said Pat Saavedra, President and CTO of TELoIP in an interview. TELoIP’s solution starts with VINO Edge devices, which sit at the customer premises, such as a branch or remote office. The VINO Edge is an x86 box made in Taiwan. Saavedra said the Edge starts at under a hundred dollars for 50Mbps throughput, with boxes that go up to a Gbit and beyond. The VINO Edge is also available as a VM. VINO Edge steers packets across the aggregated links. The company claims it can shift traffic across links without dropping a connection, even for real-time traffic such as VoIP. Customers can mix and match ISP circuits to link the VINO Edge device to one of TELoIP’s POPs. 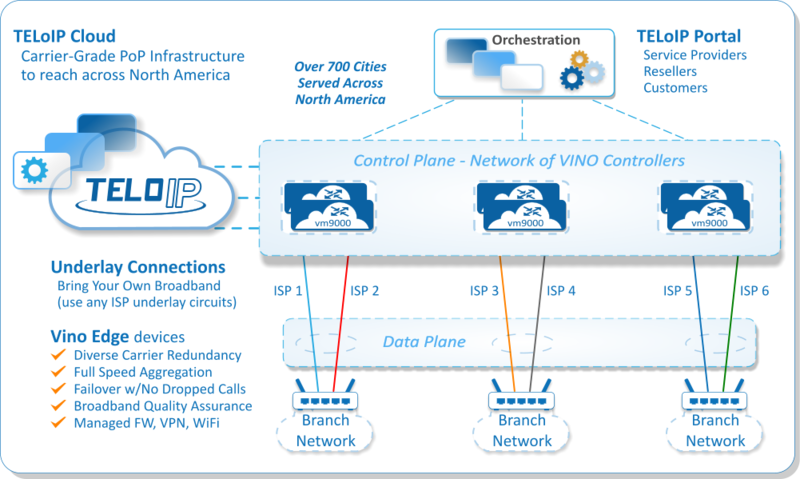 Within the POPs, TELoIP hosts its VINO Controllers, which act as the control plane for TELoIP’s virtual network. The controllers move traffic across TELoIP’s own virtual network, and enforce security and acceleration policies. The TELoIP Portal provides provisioning and management for providers and resellers. In addition to SD-WAN, TELoIP can provide firewalling and VPN services that can be resold. There are, frankly, an embarrassing number of SD-WAN options for customers to choose from these days. By targeting the provider and reseller market, TELoIP has an opportunity to carve out a respectable niche for itself, because the majority of SD-WAN players are going after mid-size and enterprise customers directly. Because it sells to providers and resellers instead of the general market, TELoIP essentially amplifies its own sales efforts. That said, TELoIP doesn’t have this space to itself. Startup Versa Networks is an SD-WAN vendor that targets carriers and service providers to make it easier for these players to sell SD-WAN services to their own customers. And other companies are, like TELoIP, building their own private virtual networks to ensure service quality, performance, and security. Two examples include Aryaka and a recently birthed startup called Cato Networks, which emphasizes a suite of security services alongside SD-WAN capabilities. The upside of all this activity around SD-WAN is that the concept is being proved out with real-world customer deployments, and organizations are likely able to find a product/service with just the right fit for their needs. The downside is that organizations looking to adopt SD-WAN will have to put serious time into parsing the strengths and tradeoffs of the multitude of available options, and do a little forecasting on which vendors will remain viable for the long term. Good stuff Drew. Good to see someone is able to keep up with this growing and changing market.